Many of the vehicles on Isle au Haut are unregistered, old and have operational problems. It's difficult to get junkers off the island because it means paying for a pricey barge to haul the vehicles away. 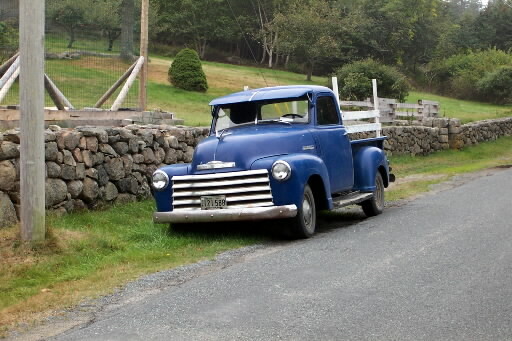 A 1947-1952 era Chevrolet pickup truck on Isle au Haut. 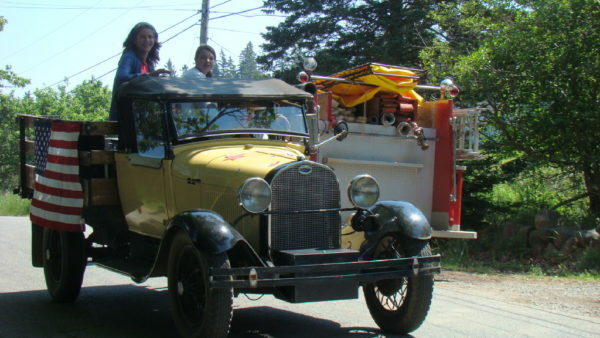 Many vintage rides of Isle au Haut play a role in the Fourth of July parade. 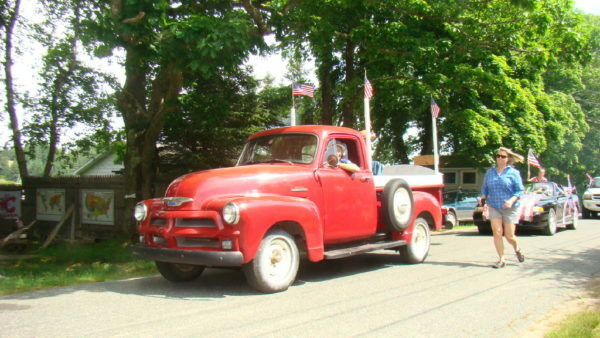 One of the vintage island cars of Isle au Haut is all spiffed up for a Fourth of July parade that happened a few years ago. 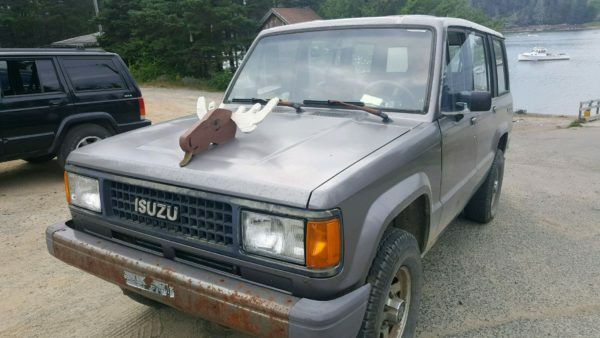 An older-model vehicle with a clever hood ornament is one of Isle au Haut's island cars. Some of the vintage cars that are still in use on Isle au Haut. One of her favorite island car stories is about the fisherman who needed to set his traps in the spring, even though his truck only would work in reverse. Undaunted and unable to get to a mainland mechanic in any kind of timely fashion — often it can take a month or more, especially during the off-season, to get a vehicle off-island, repaired and returned to Matinicus — the fisherman did what so many islanders must: He made do. The motley fleet of vehicles that can be found on Matinicus and on every other populated Maine island without a convenient car ferry fills an important role. Residents rely on their cars and trucks to get around, to haul building supplies and groceries and to do a day’s work as a fisherman, landscaper or other tradesperson. In other words, island cars in all their rusted-out glory help to make island communities run smoothly, even if they themselves don’t. In Maine, registered island vehicles are exempt from the inspection laws. According to the Maine secretary of state’s office, 2,172 vehicles are registered for island use, meaning they must be operated exclusively on an island that has no state-maintained roads — there are 13 of those islands altogether. On Great Cranberry Island off Mount Desert Island, which has no car ferry, a number of parked island cars greet passengers disembarking from the mail boat or the passenger ferries at the municipal dock. Some sport obsolete license plates or endearingly ancient bumper stickers. Most look a bit worse for wear. Cars get brought on and off that island via a private barge, which charges about $250 per vehicle, so it’s not inexpensive, White said. That means people are more likely to try and keep their vehicles running. The island’s rolling stock includes a 1948 Plymouth, an old Studebaker pickup truck that dates back to the mid-1940s, and a Ford Model A Woody station wagon. Keeping the fleet gassed up can vary from island to island. On Great Cranberry Island, there is a cooperatively owned gas pump. Other islands with stores or businesses may offer fuel for sale. On Matinicus, though, there’s no service station, fuel dock or fuel truck on the island, Murray said. People with their own boats can bring gas in containers from the mainland, but mostly folks who need to fuel up line up at the wharf when the “oil boat” comes, she said. Sometimes they wait a couple of hours to be able to buy fuel off the boat, which is dispensed only by people who have the training to handle fuel hoses. “Somehow it works, more or less,” she said. And keeping the island cars in good repair also is a moving target. White, on Great Cranberry, has had on-island boatyard mechanics work on his vehicles and said it’s good to have a simpler car. Another quirk of Great Cranberry is that most of the owners of the vehicles parked at the lot by the municipal dock on the island leave their keys in their unlocked cars. That’s because the lot doubles as a landing pad for Lifeflight of Maine helicopter and at times may need to be moved in a hurry by whoever is available. That kind of community-minded spirit is not limited to leaving the keys in the ignition, either, White and other islanders said. On Matinicus, Murray drives a Jeep Cherokee she said is on its last legs. “I’m afraid the door’s going to fall off in a rainstorm or something,” she said. She’s looking for her next island car. And even though the vehicle won’t have to drive far — there’s not much in the way of roads on Matinicus — it has to be hardy. When it’s time to finally say goodbye to her old Jeep Cherokee, Murray will have to take it off the island, and that is just fine with her. Beginning about 15 years ago, the islanders have been working to reduce the numbers of dead vehicles that rust into the island’s scenery forever. One heady day, Matinicus islanders hired a Prock Marine barge and a big crane and spent all day pulling and twitching the dead cars off island. Nowadays, if you haul a bring a vehicle over to Matinicus, you have to pay a $250 deposit to the town. Over on Isle au Haut, resident Kendra Chubbuck, who drives a 2004 Subaru Forester with nearly 150,000 miles on it, said that even when you think a vehicle is dead, it often gets resuscitated by someone else. Before she started driving her current ride, which sports a cracked windshield, has a falling-off muffler and is rusting out, she drove a 1997 Jeep Cherokee with more than 180,000 miles on it. It kept getting flat tires and seemed like more trouble than it was worth, so she gave it away to somebody else, and they gave it away to somebody else. And so on. Still, she also sees derelict vehicles that she believes really ought to be hauled off Isle au Haut that remain there. Her husband, John DeWitt, drives a 1997 Ford truck, a multipurpose workhorse of a vehicle which has occasionally moonlighted as a tractor. “It helped us build the house, pulling out tree stumps and pulling out rocks,” Chubbuck said. 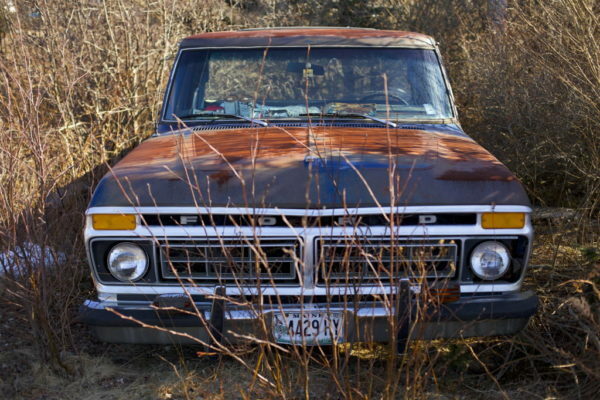 The four-wheel drive has given out and the back end rusted and has been replaced by a wooden truck bed. Nevertheless, they have no plans to upgrade. “I’d kind of hate to get a new truck,” DeWitt said. 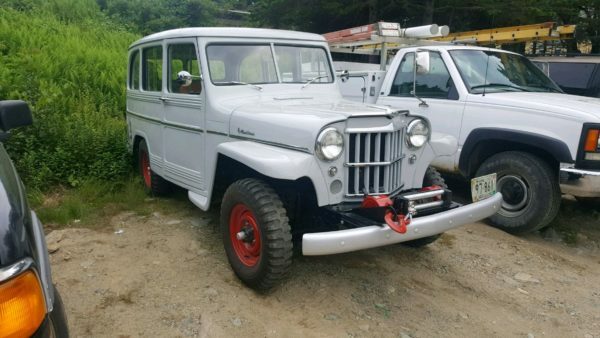 For Chubbuck, the very old vehicles that have made it out to the island and never made it off help to give Isle au Haut some of its character.